Dear Friends I have changed my blog and also my rug book site. If you get to either one, it will reference the other. I am working now to make a slide show that can go on each website, showing photos of the old house before we lost it. In addition I would like to make one with my rugs on it for the rug book site and one with old dolls on it for this journal site, (blog) It is wonderful what all we can do with photos on the web now!! I have had great assistance from two friends, Dixie and Sharon. Besides being moving day for the blogs, it is moving day for my doll family, At last I have gotten a third big glass case for my bedroom and I am finding that even so, they are a bit crowded! Some will have to continue to live in the bathroom on a counter and some in the library in another smaller case. I had a friend Elizabeth, when asked where she was going to put her grandfather clock when she was moving to a smaller house, replied emphatically that she would keep it if she had to keep it in the kitchen sink!! So things aren't that bad yet here. Photos above, 1 st shows some of the dolls still left out. 2 nd is 3 girls up high who are very happy with their perch out of danger and able to observe the rest of the dolls. Third shows the chinas and parians who are more or less permanently in the bathroom on a counter. last shows the 12 feet of glass cases. Wish me luck as I shuffle all this and try to line the backs of the cases and so forth. I am thrilled to have a collection going back together, and a place to put them. Change happens! 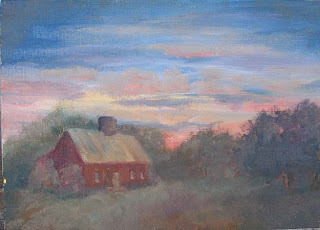 As many of you know, we have moved from our farm after fire destroyed our beloved 1768 Connecticut cape in May of 2005. We live in the town of Fredericksburg now in a new stone house which is starkly white inside and out, floor to ceiling. The antique business and the hooked rug pattern business are gone along with the farm and the goats and the wild flowers. 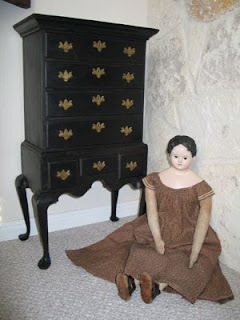 The challenge is to adapt and reconfigure our way of living, as we work to restore our smoke darkened furniture and the fire ravaged doll collection which I had assembled and loved in a lifetime of collecting early dolls. It is not Stuff we lost in the fire, but rather our way of life. Comparable changes happen to many people in the river of life, think Katrina!! This web log is a journal of this adventure, and is dedicated to the many friends who have helped us in this journey and whom we are privileged to help along also! Some of the entries are copies of letters to friends. Starting over in a new house. After several months of searching for a house that felt warm and cozy and welcoming to us, we compromised mightily and purchased a new one in a pretty subdivision of Fredericksburg. After living with 240 year old New England pine floors and wide chestnut beams overhead in the farmhouse, white tile and white carpet along with arches and coffered ceilings seemed hard to accept. At the same time we knew we were lucky to have a good safe house, again comparing ourselves to the people who lost all in Katrina. Our situation is lovely compared to theirs. Jack and our daughter Beth and son in law Gary worked six weeks to simplify the new house, sheet rocking to level the arches. taking out extreme green countertops in favor of slate gray, removing Italian grape wallpaper, and replacing ceiling fans in the major rooms with candle style chandeliers from Moses Willard. A flying saucer or something like one covered two large florescent fixtures in the kitchen. It was removed and neat can lighting went in. Gary put dimmers on most of the lighting, including the over counter lights in the kitchen, saying "Mom now you have candle light". Changing nearly all of the light fixtures made an unimaginable difference through out. We moved no walls, nor made any major changes which might compromise the integrity of the house. Rather we are warming the interior with our collection of earth colored stoneware and red ware, the pewter and delft and newly upholstered furniture, crewel over some of the windows, and the beginnings of a library of books again. It is a comfortable house, with large spaces and ample seating for people and activities. There are guitars and a banjo standing in a corner, and big speakers to sound our favorite records. The first thing our friend Helen said when she saw our new house was "Of course you will replace the front door!!!" It was leaded glass and very fancy and we replaced it with a paneled door painted the green of the house trim color. Jack has made a space for his woodworking tools and is beginning to do woodwork again. I have set up an easel by a north window so I can start back to painting, and have a space for sewing and for rug wool. The early furniture is shocked by its new surroundings, but the crewel swags help over the windows. The new house is surprised at us too, it never expected hooked rugs and baskets of wool and a large spinning wheel, but now has them. Greatly missed are the twenty oriental rugs lost. We are thrilled to have a large one now for the living room and three small ones to scatter about and cover some of the white floor. Life has many storms, and Jack and I have endured our personal one this year. We think of the thousands of hurricane victims and their suffering and continuing displacement, and give thanks that we were not taken out of our very community. Now that we have moved into a clean new house in town, we are unpacking and sorting papers and books and trying to put our lives in order again. The heartbreak of loosing our old house is still fresh but we will hold dear the memory of those years in the little red cape for all of our lives. We are grateful to have a house again, and plan to fill it with grandchildren and friends and music and books and paintings and pumpkin pies and happy memories so that soon the new one will be home to us. This week there is a Christmas wreath on the front door and sleigh bells on the inside so that they sound each time the door is opened. Let us all open the door of our hearts to the ringing of bells and the possibility of joy in the new year. Dear Friends, As many of you know I am spending much of my time and effort these days restoring some of the antique dolls that were in the fire. For the most part, we cut away the sodden and blackened bodies with their ruined clothing which was once so dear, and discarded everything but the doll heads. A very few of the bodies we elected to keep, and one of those was taken apart today to make a pattern for a replacement. The doll is a glass eyed papier mache' head made by Andreas Voit, and dates not later than 1850, and is more often thought to date about 1840. When I purchased it, it had it's original body and clothing except shoes. 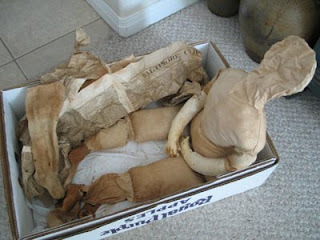 The doll's torso was made of homespun sheeting, either sturdy cotton or linen, hand stitched and nicely made. The legs went out with last week's trash and the arms are long gone. Now I wonder what I may have discarded! Jack carried the stained body to his work bench to take it apart and save me from breathing the dusty cotton lint. He parted the seams and eased the pieces apart and called me to come see! The stuffing which had been used included only a very little cotton at the top or neck portion. The rest was filled with ravelings and bits of fabric deemed too insignificant to use in any other way. There on the work table lay all the tightly wadded little bits of fabric, most of them cotton prints, hidden away inside the doll's body for all these years, a century and a half! What a treasure trove of little patterns, we think more than 30 different ones, we have not counted. A few pieces of fabric are large enough to do some tiny thing with. A large part of the joy in loving antique things, is discovery and study. I plan next to take some of the fabric bits and shake them in a jar of luke warm water and see if they can survive a gentle washing and pressing. It will be fun to lay them out and photograph them to share with friends who enjoy fabrics as I do! A collection like this with a pretty firm cut off date could help to date quilts and clothing from the first part of the 19th century. Such a collection also shows what the Voit doll itself might properly wear. The doll was originally clothed in a wonderful little boy's dress. Penny Scroggins came this evening to see our treasure. An overwhelming preponderance are brown prints. There are bits of red and some of the lovely old blue greens. Dear Friends, Yesterday I finished washing and ironing all the little bits of very soiled fabric from the doll stuffing. Some of them just melted away. The rest are in a nice stack of ironed pieces, ready to arrange and photograph and perhaps find someway to make a tiny patchwork quilt of them to keep them as a little collection, I am not really skilled in making such a thing. Many are near rotten. Perhaps putting them in a framed collage would work? 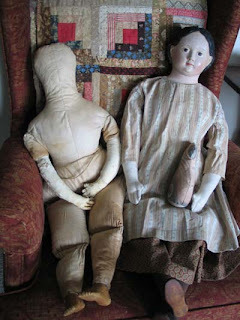 My mother had a life long interest in all dolls, including antique dolls. She won several blue ribbons at the state fair with her doll houses. My earliest childhood photos always showed me with a doll in my arms. I began collecting old dolls at the age of 23, I am past 75 now. My love then as now was the early ones, papier mache's being the main interest, with china heads close behind. . Over the years. dolls came and went, graded up or repaired and passed on, usually never more than 40 in the house at a time. In 1980 my husband (Jack, as Irish John's are often called.) and I moved to Fredericksburg Texas where we built a nice business as antique dealers and craftspeople. I continued to add old paper mache's, loving especially the Voits. We brought a 1768 New England cape house to Texas in 1992 and erected it on our little farm. There was a great little room under the eves upstairs for the dolls. Each doll was a little personality or character to us, and was named and treasured. Jack built great doll furniture for them. Love and effort was lavished on their clothing and setting, with small pieces of old Redware and little books and tiny textiles like the doll quilts and bonnets, not to mention the expensive little shoes!! In May of 2005 while we were in New England buying antiques for our shop, lightening struck and the red cape burned and our lifestyle was shattered forever. The damage to the house was beyond our means and strength to restore. The little room under the eves got the worst of it, Firemen battled the blaze for over 4 hours. They handed out blackened little bodies of the dolls soaked through and through. Prized 18th century portraits were lost and all oriental rugs went to the dump. Our collection which had filled the house was cut in half. (We are grateful for that remaining half!!) It was black devastation we flew home to. I screamed and cried as you may imagine. Many of the favorite dolls never came out of the ruins. Of those dolls that did, bodies and clothing were sent to the dump, and the blackened heads set aside to dry out, It was months and months before I could even look at them. The farm is sold, we have found and moved into a new home in the city now, and one year after the fire finds me buying a few dolls while working to restore some of the blackened ones. The china heads, of which I had only a few, cleaned up well and are accepting of new bodies, and hopeful of new outfits. Is there ever justification for repainting papier mache's? Serious collectors will not have one that has lost it's original painted personality. We have come a long way from collector Madeline Merrill who wrote "The Art of Dolls" and who routinely repainted paper mache's, and is so pictured. I have the head of a great Voit boy from her collection that she had repainted, should I not repaint him again? Could I place another lovely flirty eyed voit boy head in the garbage? No, I am repainting them, and calling each by name as they look at me again. What is will never be what was and still I must try. I only hope they will not be scorned and that someone will treasure them and give them care when I no longer can. Many little heads are still waiting. Yeah! the proofs on my pockets and rollups book came from the printer yesterday. I have sent them back with a note of approval and expect to have my new books in hand within two weeks. I will go to San Antonio on the day the books are printed and watch as the huge 10 color Heidelberg digital press rolls out the first sheets. These I must check for color balance and initial and then the big press, as long as a locomotive, will roll out the book pages. It is a champagne moment! Then a few days later when they are covered and fastened together with the pattern insert in the middle, Jack and I will go back to SA with a trailer and bring home a great stack of boxes, where to put them I have no good idea! I have my first two orders for the book this morning. Thank you!! November 15th 2006 Sawdust in Rag dolls?? Wanted you to see what Jack and I have been working on. I have restored a dear old glass eyed mache of about 1845 and Jack has made this stunning little black highboy that is 33 inches tall. Jack plans next to make a doll size northshore cupboard. Taking somebody apart! This is the body from the 10 inch papier mache doll head pictured further down the page. The stained old body was leaking sawdust all over so could not very well be left as is. Question was to patch it or recover it or replace it with something clean and sturdy. The large paper mache head was on this body with very tightly fitted dear old shoes. I began by taking off the sox, very holey, but charming. 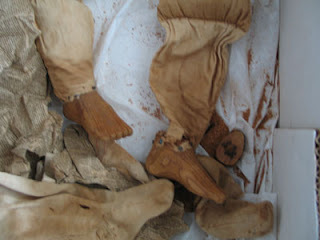 inside the sox, the otherwise rag body has carved wooden feet! The feet are held on with tiny old tacks, which DH said may be as old as mid 19th century. Beautifully done, with distinct toes, not the least primitive. Were they made for this doll body? My husband thinks maybe so. Were they part of another doll or artist figure or creche figure? I would guess that. They have never been painted. It is amazing how closely the old old shoes fit. The head had clearly been off the body, as the glue is yellow but not really old brown glue. So off I took it again. The head has a patch inside the back curls. The top of the body was a surprise! There is made in the same piece with no seam at the neck, a head shape! No face or indication it was ever used as a head, just wadded up and stuffed in the neck. See photos, click each to enlarge. The entire old head and body is hand stitched, with back stitching for strength. The torso is cotton twill, the legs and upper arms smooth old cotton. The worn out leather hands, much patched, are lately attached with white thread unlike any other on the body, obviously not original or even with her a long time. Now to the stuffing! Some parts are stuffed with sawdust. I will open a seam here and there and remove that, place cotton gently and not too tightly in place and sew the seams back together. Some parts are stuffed with cotton, will not bother that. And the top of the body has a great deal of wadded up newspaper, the Baltimore Clipper of January 10 1860. Reading all the notices in that is fascinating! One notice is about the Mount Vernon ladies society purchasing Mt Vernon from a Washington descendant. in the sawdust of a lower leg is a wad I think says 1861. I am debating now what to do with the doll's interesting inner self! I believe I will make a fresh body for the papier mache head and dress it as planned. I have bought a nice old dress for her. If I do that , I can keep the old body, feet showing and head lightly stuffed and sit it around naked with the rest of the dolls. It seems too interesting to cover up. The newspaper will be put in a plastic sheet cover to protect it and help flatten it. There is a name inside the papier mache head in pencil, not really old writing, Ruth Hancock I believe. Maybe this is the person who mended the curls in back. Or it could be the name of the original owner. Now that the yard work is settling down for the summer heat, I am thinking more about the inside of our home. Jack is restoring and making a new seat for a lovely old blue painted Queen Anne arm chair. I am adding to our linens and bed coverings. A used Matelasse bed spread in several dye baths of dark blue or navy rit dye in the washer, looks a great deal like an old indigo linsey woolsey to a casual glance. Use Rit Tan dye, and you have a burtternut one. Friend Penny has dyed one of each of these and also one in a luscious shade of coral-rust. We like using the liquid dye. Getting a deep color with so much white fabric takes more than one bottle of dye. Penny dyes successive times to have control over the depth of color. Televisions are a continuing problem for the decorator, and they are getting larger and larger!! For a time, we could hide them in awkward shaped cupboards, but not these new monsters. I have been giving thought to how to enjoy them and still put them out of sight when not on. I would like to hear back from people with other interesting solutions. If you can manage to have a new thin Television mounted on a wall over a blanket chest or mantel or dry sink or other suitable furniture, placed about as you would hang a painting or a nice hooked rug over the piece of furniture or mantle, here is one way to cover it. Make a frame of 1 by 4’s or what ever depth is needed to conceal the sides of the TV. On one side of the frame mount a reproduction wooden blanket crane made to fit, with either a large piece of a woven coverlet draped on the crane or a hooked rug hung from it, or another attractive textile. Be careful not to over load the blanket crane, it needs to be a sturdy one. It is necessary to think ahead about the wall where the crane will swing when the television is in use.